It's Back!!! And goes on sale 10/12!!! I believe it will be $250! I was literally just about to create this as I saw the same email. YAY! Love this box (mostly - last year was a bit tough to love as too many overpriced items...but still love the same). Funny that this year is "$500 value" - last 2 years were over $600. @@boxesandboxes I was thinking the same thing about the $600! Maybe they will include items that are price inflations! I would be happy with that haha! I stand corrected - didnt read very closely. 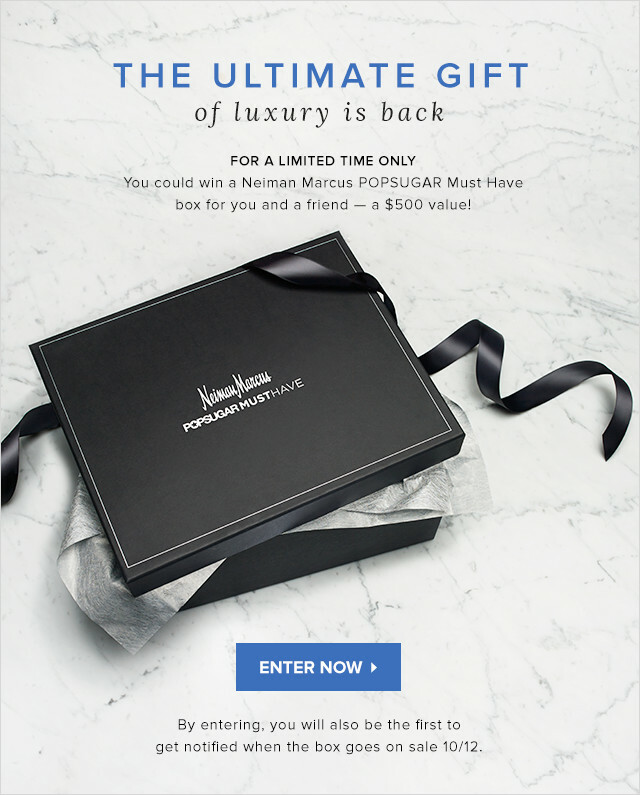 The "$500 value" is for two boxes- "you and a friend" ($250 each). We don't know the retail value yet.... whew! These were my exact thoughts on the value. 2015 will be $500? Maybe they are under-promising and over-delivering? If it still costs $250, I may hold off this year...although double bang for your buck is still a good deal, I am hoping they end up selling them in stores again and I can see full spoilers before committing. (edited to note and include @@boxesandboxes comment above)...phew! Good catch on the value of the box cost vs retail value of contents! Fool me once shame on you, fool me twice shame on me. I'm totally out this year unless they release a decenter spoiler. I can live with it selling out. UGH I am so torn on this. I'm tentatively saying I'm out because it's a lot of money and I didn't really use much of the box last year. I always tend to fold on these though. Hopefully it sells out quickly and makes the decision for me. I'm in! I loved both of the past NM boxes. What I didn't use made amazing gifts & I also swapped for some multiples, like the Missoni candles. The only thing that bothered me last year was seeing them sold at NM too with the promos after I had already bought my box from Popsugar. I would much rather buy from NM & a promo or discount would be awesome. I wonder if they'll try that again since so many people were upset? I don't want to miss out, but I always love a good deal. I called the 800 NM number & the CS rep couldn't give me any info on the upcoming box because she wasn't able to look it up. Does anyone know if every Neiman's store carried it last year or if it was only select locations & what department or area it was on display so I can call to try to get some info? I'm not near a NM, so I never saw the display in person. FYI-the NM Christmas book is out online & last year's book had items from the previous Popsugar boxes, the Sydney Evan necklace & the face cream, there is also the J Adler zebra tray in the book. Might be some clues as to what we can see this year! Maybe? The promo thing made me so mad - people who ordered through NM (and got it earlier than us) saved $50 ... and I was a loyal PS subscriber who paid full price. I saw it last year at Neimans in Troy,MI. The box was on a shelf display in the center of the store with other Christmas gift ideas. I think they had some sort of charity gift section that proceeds went to a specific cause-- the PS box was part of this gift section. Sorry, I don't remember the specific department. Thank you! I'm going to try to call & get some info. It was available online at NM last year and in stores (the Palo Alto store near me had it). The only reason it was discounted was because NM was running a pretty broad store wide promotion so it ended up including the PSMH LE box too, and then people used an ebates 10% off deal on top of that. It was more than $50 off of the original price that people who ordered through PopSugar paid. ETA: I wasn't mad that the price changed later, it was that PS did nothing for the people who paid more. Even a $10 credit on my account would have smoothed things over with me. yeah, i had bought 2 so it really stung me. they could have made those as exclusions. but yes, I thought PS should have done something for us. Ah! Back and forth, back and forth! I can't decide if I'm doing this or not. I generally sit this one out, I almost bought last years via NM with the $50 off promotion. But my credit card wouldn't go through on the website. Ha! I'm curious if this will be sold in stores this year as well. I've never bought this box before, but I'm giving it a try this year. Hope it's a good one! The email says there are 7 items, not sure if that was already public knowledge but it was new info to me! I'm out without spoilers / potential discount. I went for this box, I must be crazy but I skipped the Luxor Holiday Box and I am cancelling my Oui Please box, so it was justifiable. I am a little scared after the CFDA box dupe, but I like NM and Popsugar, so excited. Does any know the total value of the box? I'm out unless there is a spoiler. I can understand their philosophy of no spoilers but that philosophy IMO should be revisited. All other higher cost boxes, and lower ones too, release at least 1 spoiler. For me I was "burnt" on last year's box and the CFDA one so I'd rather spend my money on items I know I can appreciate or gift. I did it! I wanted to buy from NM this year since people who did last year got it faster, knew what was in it when they purchased, and got the $50 off... Kinda sad that's not an option this year, but I know that they won't be discounted or anything else to make me upset that I bought from PS so I just hope we all love it! I just noticed on the PopSugar site it says "Sold exclusively on PopSugar Must Have" so assuming they know the meaning of exclusively, it looks like it will not be in store.